Cover picture: : I was lucky enough to spend five weeks in the States this Spring. I saw many rare plants and many of these in flower. This Sclerocactus wetlandicus was just one of many scattered over a hillside in Utah. They can be tricky to spot but not when they flower. I saw this before I even got out of the car! You can click the picture for a better one. Welcome to another issue of NN; maybe the World’s most read cactus club branch magazine. We can give ourselves a pat on the back! Not only was the Convention we organised on behalf of the Zone much enjoyed by the participants, it was a sell-out and a great financial success for both the Branch and Zone. Free BBQs and great speakers for 2009! Naturally as a paid up member of N&MK branch you will expect a report in our magazine. And you will get one if someone writes it, or them. If you enter the Show please jot down your comments, feelings or observations on a scrap of paper, (or better an email to Trev). Facts, philosophy or fiction; NN loves a good story. If you go to the Show the same; say what you enjoyed, even what you hated. (Though we might not report that.) Plants you liked, plants you wanted. Please take some digi-pics. The Ed will be there with his camera but take that snap that will amuse our readers. An Abington Community Centre cup of tea will be awarded to the best photo taken at the Show. It could be you with that cup! And at the National as well. Incidentally if you missed the last National and want a copy of our Branch’s pictures of the exhibits, the CD will set you back a quid. More if we post it. While we are girding ourselves up for the quadrennial (is that the word for every four years?) National don’t forget the Branch Show on July 26th and 27th. This is an opportunity to show our plants and impress the N&MK public. 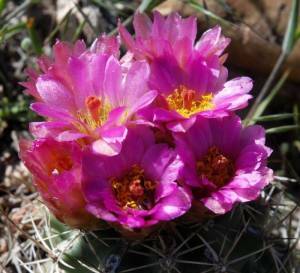 The visitors might join our society and have a lifetime of pleasure from growing and studying cacti and succulents. Really we owe it to the community - global warming is coming their way, (they say). What else can we grow? Over recent years the Branch has attended the Castle Ashby Fair to ‘press the flesh’ and sell a few plants. Jeff reckons the crowd there is different from the usual plant fair fare and we refer to them as the ‘green welly brigade’. Sue, (the F.L., her indoors, the missus etc.) went along to see the crafts and chatted with the cactus crowd. What did the F.L. buy at the Fair? Well naturally a pair of green wellies! (You will know of course that the ‘restrooms’ of the US are not for resting in (we’d call it the loo) and the WABs are the wags-at-the-back that you always get at cactus meetings. 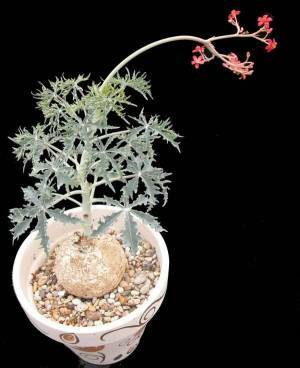 At the NMK show in 2005 there were two plants of Jatropha cathartica, an interesting caudiform species. The leaves on these specimens were so different that I wondered if both could be correctly named. I started a Google image search. Sure enough the pictures showed both forms of leaves and it seems that young plants or stems have just juvenile foliage. A close look at the right hand plant showed dissected leaves developing. 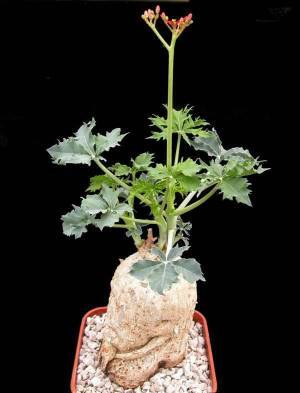 The plant gets its common name from an invalid old name of berlandieri. Google also showed that the species was a toxic weed of Texas and Mexico rangeland and related species had such names as nettle-spurge and bellyache bush. Better not eat your Jatropha! The net also suggested that the species could be grown from hardwood and softwood cuttings but I would imagine that seed would be the normal method. Now where can I get some? The FL was touring a friend’s greenhouse and noticed a slotted shelf. And what’s going on here? You can contact the Ed of Northants News by joining trevorwray with the usual 'at' sign and aol.com. Northampton and Milton Keynes Branch of the B.C.S.S.